Very slow moving, and the premise seems unreasonable. No one would overthink the situation like the main character. A good read; a good story; but typical of Grisham the ending, although full of irony, was weak. I can't believe that some people didn't like this book. I thought it was excellent, an interesting diversion from Grisham's usual stories. I just wish there had been an epilogue, since that ending just seemed to need closure. Michael Beck was a great narrator, and I'll certainly look for more of his narrations. 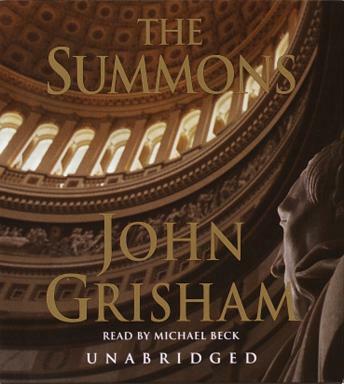 John Grisham is as always at his best. Reader is excellent! This book is definitely not as good as a typical John Grisham novel. It was very slow and not very exciting. Not sure I would recommend it to others. Stick with his other classics. This book had me wanting to not put it down once I started it. For me it was great, took place in MS where I grew up and also had the main character flying a plane which I love to do as well. It was fast moving and full of suspense. Did not learn about the summons until the end. Great book. You will love it. Grisham is always good-at times great--this effort is good-but-not one of the better examples of his work. This was by far the most boring book I have read/heard. It didn't climax at no point. I don't want to say, that it was predictable, but it was simply not exciting at all.